Whoever browses the catalogues of nationalist bookstores, whoever reads nationalist newspapers and magazines, whoever visits Internet forums where young and not-so-young activists of the nationalist right express opinions will immediately notice that rabid anti-Islamism reigns. 1) Is an Islamophobic attitude an integral part of the national movement? 2) The reasons for this apparent Islamophobia. 3) The political consequences of Islamophobia. 4) What proposals are there for a national politics given the confrontation of Islam? Is an Islamophobic attitude necessarily part of the national movement? An objective approach to the facts calls for a reply in the negative: Islam was not always looked upon negatively by nationalists, and at present, hostility toward it is not absolute in the ranks of committed rightists. In the brief span of the few minutes to follow I will go over the history of a selection of our ideas, by looking at how they have evolved in the presence of an alien religion. At the end of the 19th Century, an era when anti-Semitism among Frenchmen was common on both the left and the right, Islam had, in the eyes of certain nationalists, an important advantage: it was hostile toward Jews! When the Moslem revolt of Bachaga Si Mokrani broke out in Algeria against the Crémieux Decree (which, remember, gave French nationality to Jews of the Maghreb) the immediate reaction among committed French nationalists was favorable. Edouard Drumont never omitted to praise this popular uprising in his writing, and for nationalists Algeria was a land of mission with high electoral potential. For his part, Gustave Le Bon, a strong ideological reference for many of those on our side, published a book at the beginning of the 19th Century called “The Civilization of the Arabs.” In this work he emphasized the huge influence of Moslem civilization which, for him, civilized the barbarian peoples who destroyed the Roman Empire and opened for Europe the world of scientific, literary, and philosophical knowledge of which it was ignorant. In a word, for Le Bon it was the Moslems who “recivilized” Europe! During the interwar period it was completely natural for nationalist leagues and parties to welcome Moslems into their ranks. According to reports at the time from Paris police headquarters, when North African natives got involved politically it was with either communists or nationalist leagues! Thus, there were lots of Moslem Maghrebians in the French People’s Party, and the group French Solidarity had so many Arab members it was sarcastically referred to as French Sidilarity. [Note: “sidi” is a word adopted into French from Arabic and means an Algerian or Moroccan native.] At the same time, right-wing French intellectuals succumbed to the attraction of Islam: René Guénon converted; so did the female futurist Valentine de Saint Point. In accord with the preceding, during the Second World War many French-Empire Moslems were in sympathy with the Axis Powers and some even fought in German uniforms, where they encountered Balkan co-religionists induced to join through the influence of the Grand Mufti of Jerusalem. As many other Moslems took part in fighting with the Free French forces, there was virtually complete sympathy for Islam after the war on the part of the various components of the nationalist right. They who collaborated did not forget Amine al-Husseini’s enlisting on the side of the Axis, and they appreciated the benevolent asylum which Moslem nations granted to certain of their outlawed exiles. They who opposed Germany were grateful for the African Army and its Moslem regiments. Decolonization, the Algerian War, and the Iranian Revolution didn’t really change any of that. If a significant part of the nationalist right became “anti-Arab” and flirted with philo-Zionism, it was not anti-Moslem. In fact, [in its view] there were good Moslems, as witness the Harkis [Note: “harkis” were Moslem Algerians during the Algerian War who wanted Algeria to stay attached to France. ], and the Moslem anti-communist resistance in Afghanistan and the Soviet Central Asian Republics. Thus, Maurice Bardèche wrote that, “In the Koran there is something virile, something one can call Roman”; Jacques Benoist-Méchin had success with works looking with favor on the Wahhabite dynasty, and his “Frederick II” praised that emperor’s alliance with Islam. As for François Duprat, he saw in the Islamic Brotherhood an Arab version of the ideology he was fighting for in France! When the New Forces Party demonstrated against the Islamic Republic of Iran on Nov. 26, 1979, it wasn’t because the Republic was Islamic but because it was anti-western and was holding American diplomats hostage. A few months later the Raid Guild [”la Guilde du Raid”], a large part of whose staff at that time had come out of the world of the radical right (the Youth Action Group among others), played an important role in support of the newly-forming Afghan Islamic resistance networks. Finally, at the end of the first six months of 1997 no one from the nationalist movement [”la mouvance national”] or almost no one, had anything to say about Jean-Marie Le Pen meeting Necmettin Erbakan, Turkey’s first Islamist prime minister (June 1996 – April 1997). Afterward it was said this meeting was informal and had happened more or less by accident during the FN leader’s vacation at the Turkish seacoast. But you’d have to be naïve to believe politicians at this level meet by accident. Besides, it’s also not “by accident” that the leader of the FN participates regularly in the festivities organized by the Iranian embassy in Paris honoring the Islamic Revolution, or that on trips to Lebanon he meets with Hezbollah representatives to inform them of his positions on Near-East matters. There was, however, constant hostility toward Islam on the part of certain representatives of the nationalist movement (”la mouvance national”), mainly those belonging to its Catholic-nationalist fringe. A certain Jean Madiran, for example, in his work, “Farewell to Israel,” after remembering that, “We greatly admired this brave, brilliantly martial nation [Israel]. And I believe we loved it,” partly explains this infatuation by the fact that “the Franco-Israeli alliance seemed necessary in view of the Islamic tidal wave.” But this opposition remained relatively unimportant, coming to the fore late, at the turn of the millennium, with the publication of successful books by Alexandre del Valle and Guillaume Faye, and the clearly anti-Moslem activities of a newly formed party, Bruno Mégret’s Republican National Movement, a party which launched blatantly anti-Moslem campaigns starting in 1999, resulting in the formation of a French National Islamization Observatory Nov. 6, 2000. In a few years, anti-Islamism was to become a fundamental part of the language of one national opposition party. To be clear: only one party, because common Islamophobia is far from universal. In reality now, about the National Republican Movement, it is mainly the work of minorities that are more agitated than active, and of little groups of brawlers. Because if one looks at the facts carefully one can only be stricken by the National Front’s moderation in this matter. Though campaigns against immigration and its ill effects don’t cease, it seems clear there’s a desire not to attack Moslems as Moslems. This doesn’t preclude that, let’s not hide it, there haven’t been some regular and local clashes. 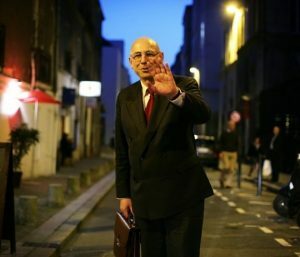 Nor is the phenomenon limited to France, since the Italian daily “Il Resto del Carlino” published (Jan. 16, 2003) an astonishing article telling about the political involvement of a Maghrebian immigrant, Hassan Bendoudouh, professor of the Moslem religion and functionary of The National Alliance of Fini! His statements were clear: “I am a partisan of Fini and Allah. […] Islam is a religion of the right, in that it honors family values and respect for parents and the ancestors,” and Mr. Bendoudouh supports the Bossi-Fini projects aiming at reducing immigration pressure on Italy! What seemed simple at the start of this conference, namely that the entire nationalist movement fought against Islam and Islamism, isn’t simple any more. One could say, “In my father’s house are many mansions,” that the multiplicity of ideas about the great problems is a good thing, etc. But how could a single political current not talk with one voice on such a delicate issue? The reason is simple: the nationalist movement no longer exists, but it doesn’t know it yet. Since the collapse of the Soviet Union [”le système soviétique”] we’re in a different world, and all the grand events that take place now result in across-the-board divisions and ruptures affecting all political families including ours. The notions of right and left that were born with modernity are in the process of disappearing with it. We’re still together out of habit; tomorrow we won’t be and the separation will be on the basis of great problems such as our relationship with Islam. The reasons for the Islamophobia of part of the nationalist movement are many. To me it’s clear none of them is justified. But more than that, there is definitely also — and especially — the result of the propaganda of the agents of influence of the Evil Empire, the pro-American and Zionist networks. This is obvious when one examines the ideas developed, which are sometimes merely exact copies that aren’t even tailored to fit the new setting they’re being used for, consisting of organs of the press or works of the U.S.-Zionist propaganda bureau. As is known, it’s favorably viewed in certain nationalist and French nationalist circles to refer, in manner reminiscent of “the clash of civilizations,” to the confrontation between Islam and the free world. That helps sell newspapers and has the enormous advantage of furnishing a simple explanation of the world’s complexity, one easily accepted by a movement looking more for conspiracy theories than political or geopolitical thought. Now, ideas must be put back in their historical context. The source of the “clash of civilizations” theory goes back to 1990. The Soviet Bloc’s collapse took away the U.S.’s role of defender of the free world; there was danger for the U.S. in the multipolar world which they saw replacing the bipolar one. Therefore a replacement adversary was needed so that America could continue in its role as world policeman. The office of U.S. Secretary of State switched therefore from its “red” theme, namely, Moscow is orchestrating a worldwide terror network consisting of Third-World revolutionary Marxist groups, to its “green” theme, namely, there is a worldwide terror network consisting of revolutionary Islamist groups. At the same time, the U.S. Secretary of State adopted the Lake doctrine of “rogue nations,” the majority of which, as if by some strange coincidence, are Moslem. All of that has to be ideologically justified, brought down to the level of the ordinary citizen of Western countries in simple, intelligible form. Therefore the system’s house intellectuals must make theories about the proposals, which are then adopted by popularizers, by agents of influence, by the media, etc., until Joe Sixpack caught in a mass of assertions all saying the same thing is convinced of these propositions. As for these intellectuals who have theorized about the “clash of civilizations,” you know them both: it’s Bernard Lewis and Samuel Huntington. Both insist on the importance of the Zionist Entity to the West’s resistance. And that introduces a second level of understanding of the anti-Islamist phenomenon, i.e. supporters of the Zionist Entity have grafted their struggle onto that of the American Party. By developing a gigantic amalgam of Islam/Islamism/violence-in-North-African-neighorhoods/obscurantism/attacks-on-women, etc., they try to make ordinary Frenchmen believe that in Paris as in Tel Aviv the troublemaker, the killer, the terrorist, the one favoring a return to the Middle Ages is the same: the Arab and the Moslem. In this light, the rabid anti-Islamism of a del Valle or a Faye and various thinkers of the nationalist movement (”la mouvance identitaire”) is easy to explain. They become zealous soldiers of Washington — freely, in the case of some (and, surely, in return for hefty cash payments), and for others, the ever-present useful idiots, through that crude stupidity which characterizes a whole portion of the French extreme right. They were militant anti-communists when the U.S.A. had to justify its occupation of our continent by citing the “danger of the Red Army,” now they’re militant anti-Islamists when the U.S.A. has to justify its worldwide ambitions. That some may be sincere, or that others may imagine they’ve found an effective angle of political attack during election season, excuses nothing. This opposition to Islam that every nationalist movement is supposed to adopt poses a certain number of fundamental problems. Now, it’s strange that no analysis has ever been done. First, anti-Islamism should be obliged to define opposition to immigration. Is the nationalist movement against the influx of immigrants because they’re not French, because they’re not of European ancestry, or because they practice a particular religion? To clarify: What’s more important, culture, ethnie, or religion? Whom should we preferentially accept onto our soil? For example, between a Moslem Bosnian who’s European and an African from Benin who is Catholic, whom should we choose? And whom among Hindu or Buddhist immigrants? Likewise, anti-Islamism should be obliged to define the issue of assimilation versus repatriation. Now, if one intends to assimilate certain immigrants they have to quickly be granted the same rights as the traditional population, including the right to practice their religion. If it is desired to repatriate all or a portion of the immigrants it would be better for them to assimilate as little as possible, remaining as distinct as possible, and in this vein practicing their religion helps preserve their distinctness. In both cases the anti-Moslem choice is as invalid as it is aberrant. Finally, anti-Islamism is pregnant with alliances against nature and paradoxical positions that have to be adopted. Should one defend the homosexual lifestyle against homophobic imams, as Pim Fortuyn did? Should one oppose a return to segregation in certain locales (schools, swimming pools, etc.) out of anti-Islamism, when a few decades ago one fiercely disputed the imposition of integration? Should one defend immodest attire because Islamists favor wearing the headscarf? Should one argue for the right to blaspheme when this right can be exercised against all religions including that of the traditional population of Frenchmen? Should one view all anti-Moslems as allies, including the most fanatical Zionists, and representatives of non-sectarian mixophilia such as Mrs. Michèle Tribalat (highly esteemed by certain nationalists) or Orianna Fallacci? Besides, there is another question, a not insignificant one: is anti-Islamism a vehicle for acquisition of power? Or, put another way, does this struggle make people vote for us? Well, the answer is … No! Various studies of the sociology of elections have shown that voters weren’t in the least concerned with this excessively abstract subject which they couldn’t connect with their daily lives. Moreover, it’s not even certain the militant nationalist base genuinely feels concern. For example, a “non-hostile” and extremely well-documented book on militants of the National Front, “With Those of the FN: A Sociologist in the National Front,” (Daniel Bizeul, Editions de la Découverte, 2003), deals at great length with opposition to immigration on the part of National Front militants but devotes not a single line to opposition to Islam. Another researcher, Patrick Lehingue, in“The Statistical Profile of an Electorate: What Do We Know About National Front Voters?,” in “Collective, the Politicization,” Belin, 2003, pp 247-278, shows clearly as far as he’s concerned that the fight against immigration, therefore a fortiori against Islam, is definitely not the central concern of National Front voters. If these people vote for the party of Jean-Marie Le Pen it’s because of a feeling of social marginalization, not hostility toward Islam or immigrants, still less because of racism or hatred of The Other. Thus he confirms what Nonna Meyer had already claimed in These “Frenchmen Who Vote for the FN” (Flammarion, 1999). In fact, the purely Islamophobic voters are few — on the order of 2-3% — and, furthermore, not ours: they’re the electorate of de Villiers or of Mégret, the electorate of a liberal pro-American Catholic right wing. It is therefore incomprehensible, outside of all consideration of geopolitics and grand politics, for anyone to favor for the nationalist movement as a whole a direction which would be an electoral stalemate, which, far from garnering us additional votes, would cause us to lose them, without a doubt. Also, it must be kept in mind that one must never mistake one’s enemy and one must always get to the root of evil. Now, evil at this beginning of the 21st Century isn’t Islam but the consumer society, the liberal system. One must then ask the question who is ultimately our objective ally? Who is closest to our ethical values? For me it’s obvious the answer is neither Washington, nor Tel Aviv, nor the CRIF, nor Act Up, nor “Ni Pute Ni Soumise,” nor Fiametta Venner, Orianna Fallacci, or Charlie Hebdo. At the everyday political level I’ve always thought our fight had to be that of religious neutrality, a national secularism. As aberrant as Islamophobia is, Islamophilia would be as aberrant. As necessary as it is that Islam have its place in France, it is just as necessary that it have only its rightful place: no more, and no less. In this regard I’ll mention someone with whom I don’t see eye to eye, whose ideological orientation is pretty different from mine. It’s Michel de Rostolan, who comes from the CNI, who is the founder of the Renaissance Circle and National Front regional advisor for Ile-de-France. He wisely says, “It seems to me necessary that every effort be developed to consolidate ‘a French Islam,’ strictly in proportion to the Moslem population having French citizenship, and ministered to by clergy having French citizenship.” One could continue by saying there must be mosques, but they have to be French and built in accordance with French law. If we want to acquire power, indeed if we want those around us to participate in it, we have to be the party of the French people in their ethnic and religious diversity, not the party of a minority of a minority thereof. Therefore from this viewpoint all Islamophobia, like all hostility toward Catholicism, must be denounced and forbidden. I conclude by reading you three subjects for reflection. The third is summed up in a name: Rabat Kheliff. I’m sure none among you knows this man. Why do I talk to you about him? Because he was born in Algeria, he’s Moslem, and he was the founder of the Grand Mosque of Lyon of which he was director several years. At this rate he has everything to displease the Islamophobes. Now, on July 5, 1962, Rabat Kheliff was the only French officer — the only one — to disobey the orders of General Katz and go with his unit to the aid of pieds-noirs of Oran [Note: the French colonists living in Oran] who were at that moment being massacred by the FLN in the city streets. Several hundred Frenchmen, whom the Catholic French officers didn’t care about, owe him their lives. Talk Given at a Conference of Égalité et Réconciliation reprinted from VoxNr.